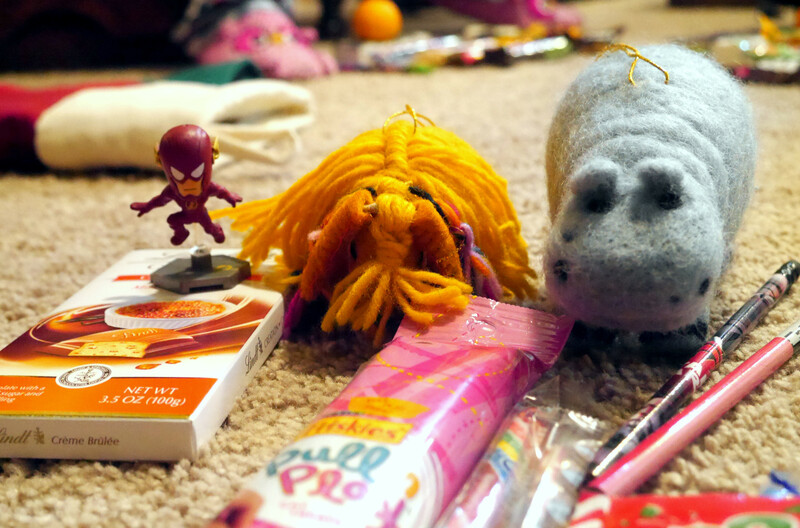 Stocking stuffers, extreme mammals, I ❤ Denver, attempts at snow shoeing, and loads of board games. Those are a few of the experiences I had this past week when Katie and Mitchell visited. They arrived on Christmas Eve so we were able to spend Christmas Day together! We relaxed by opening our stockings (we chose not to do presents), having waffles and egg scramble for breakfast, playing lots of games, and spending time with my parents. It was such a wonderful day, I enjoyed every minute of it. Katie and Mitchell introduced me to a few new games I hadn’t played before too: Marrying Mr. Darcy and Joking Hazard specifically but there was at least one other game they taught me. 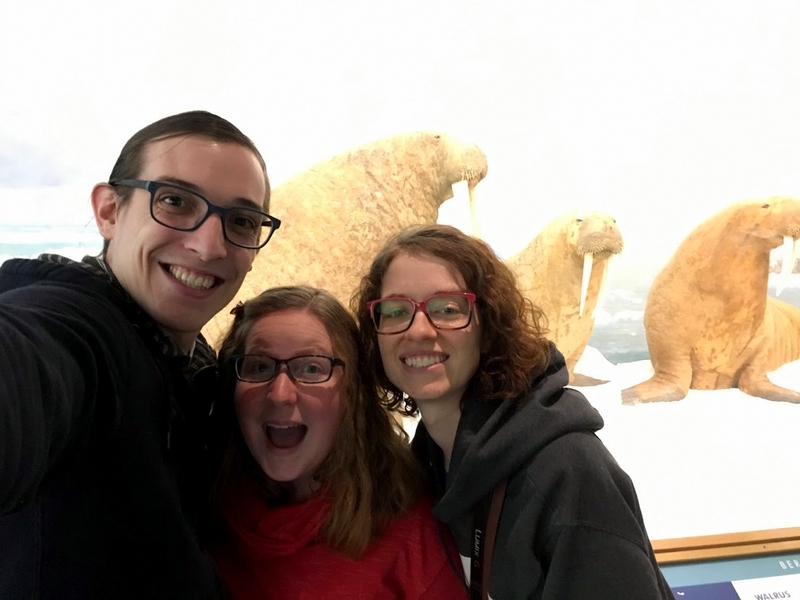 On Monday we went to the Denver Nature and Science Museum. I love going to that museum and this day was no exception. We were there for over four hours and, as usual, we didn’t go to every exhibit. We hit my favorite ones though: the animals of the world, dinosaurs, gems, and space. 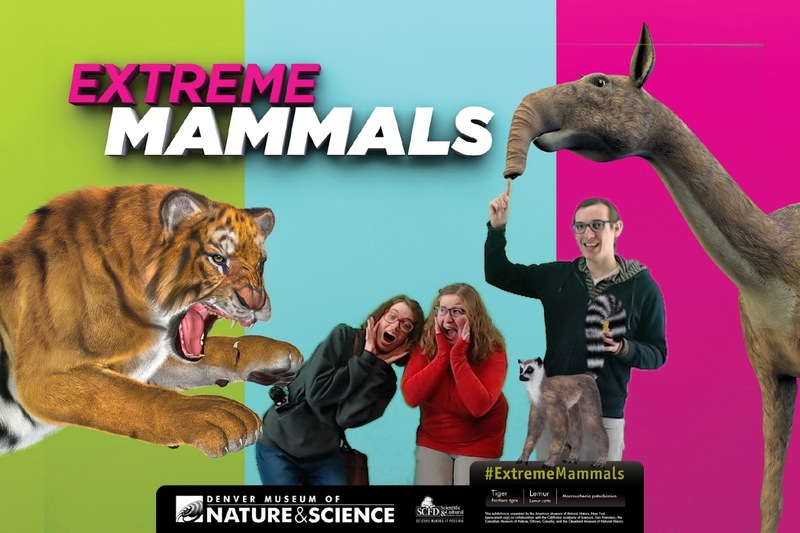 We also made it to the new Extreme Mammals exhibit where we opted to take an awesome green screen picture. Tuesday we had a more relaxed day where we went downtown to look for gifts for Katie and Mitchell’s Washington friends and family and so we could rent snow shoes for an adventure the next day. They got to see the building I worked at and we walked around downtown for a little bit. I told them about Colfax Ave, the longest street in the US (which, I have just learned is not actually true so now I feel bad-it is the longest commercial street though, whatever that means) and we went to the I ❤ Denver store, a store which I love but is generally too expensive for my taste. They do have some decent priced items and the fact that 75% of the sales go to the local artists that created the items, I think I may have to go back sometime soon and grab me some cards and magnets. We rented snow shoes from REI and ended the day with me DMing my first Dungeons and Dragons session. Everyone made new D&D characters and I led them through a fight with some yetis. I had a lot of fun and everyone else seemed to as well. 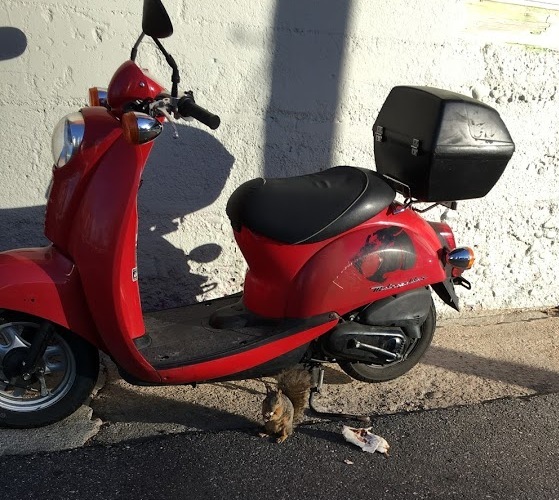 Squirrel, eating a burrito, in front of a moped – that’s Denver for you. Wednesday was interesting as we headed up to the Rocky Mountain National Park until be turned away at the entrance. The very nice ranger informed us that my car was likely not going to be able to handle the current road conditions and if I ended up stuck, the park would fine me. So we said ok and went to a nearby trail that the ranger suggested. 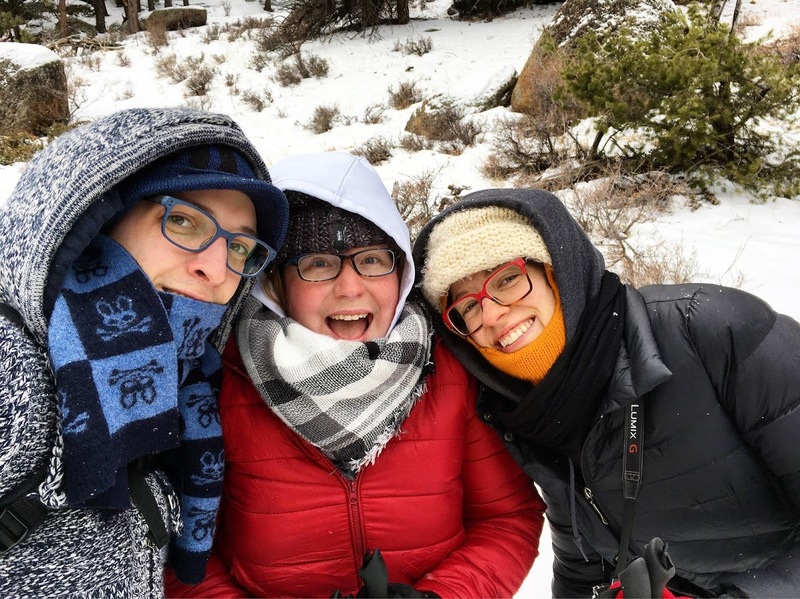 Sadly, there was not enough snow for us to snow shoe and so we hiked the trail instead. That was definitely a bummer for all of us but we handled it really well and had a good time. 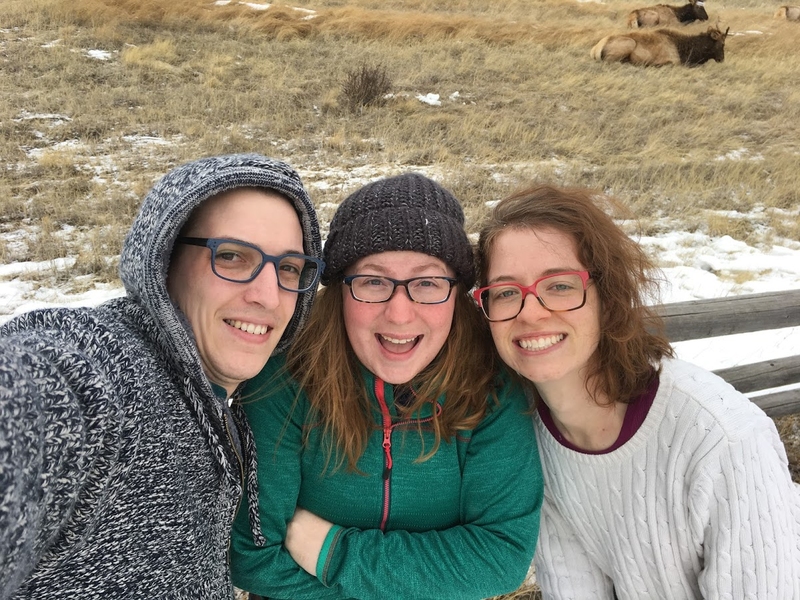 We saw elk and played in the snow that there was and enjoyed ourselves. That evening we finished up the D&D story I had created and had ate dinner at Native Foods, the vegan restaurant Elisabeth, Sidney, and I really like. So glad we got to share that deliciousness with Mitchell and Katie. Thursday was a more relaxing day as we returned the unused snow shoes, made gingerbread houses (that promptly fell apart), played more games, and visited before Mitchell and Katie had to leave. They had a 6am flight out this morning and have made it safely back home. It was a week full of fun, laughter, and happiness. What a way to end 2016!